Horizontal beaded netting is a lacy, open stitch that involves picking up sets of beads with each stitch. Each row of horizontal netting is made up of a zig-zagging horizontal line of beads. Begin a horizontal netting pattern by adding a stop bead or bead stopper and stringing all of the beads for the first row of beadwork, plus several more beads. Those extra beads enable you to make the turn that begins the second row. The beads in the first row will be pulled into position when you stitch the second row. This is similar to how you begin peyote stitch by stringing all of the beads for the first two rows. In fact, a peyote stitch is really a dense form of horizontal netting. To begin the second row, you pass back through one of the beads in the first row. This bead serves as a turn bead, and you locate it by checking your pattern. In this project, the turn is made by adding a three bead picot at the end. Other options include a single extra bead for the turn to a loop of beadwork that follows the netting pattern. The exact turn you use will depend on your pattern or design needs. Loops may be impractical for bracelets since they can get caught on edges, while they look dramatic on necklaces. You then pick up an odd number of beads (often three or five, depending on the pattern), and pass back through a link bead to Link beads are similar to up beads in peyote stitch. You stitch back through them to connect the next row to the body of the beadwork. Continue this process of stitching into the link beads until you reach the end of the second row. The number of beads you skip before stitching into a link bead will be determined by the pattern. In this case, the pattern is five bead netting, so you will pick up five beads for each stitch and skip five beads before stitching into a link bead. Pull the thread taut. At first, your netting will seem flat and close together. As you add more rows, the weave will spread out slightly and you can open the beadwork by pulling on it slightly. Add the turn beads and picot to complete the second row. To continue stitching, pick up five more beads and stitch into the next link bead. 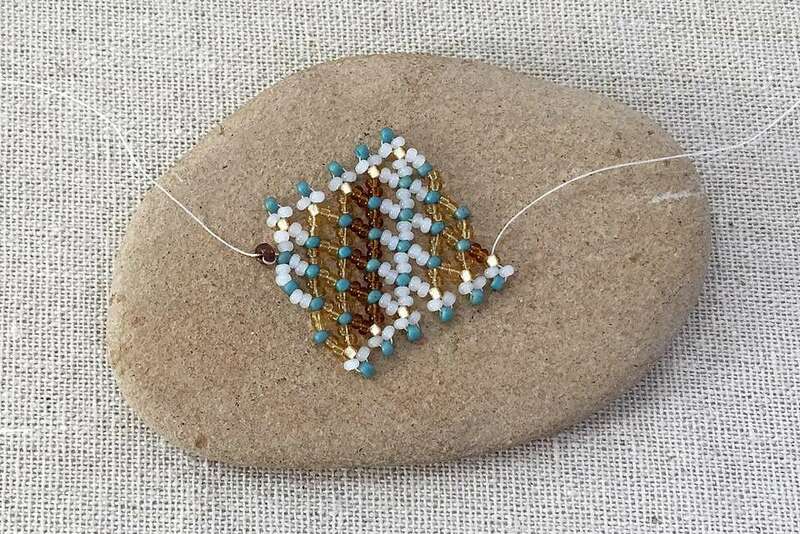 Using a different color bead for the link beads and turn beads makes it easy to identify where to stitch and at what point you are in the pattern. Also, because netting is a loose stitch that only passes through beads once or twice, it can have a habit of being loose. You can counter this by using a heavier than normal thread such as 10 lb. FireLine instead of 6 lb. Continue netting stitch following the pattern for your project until the beadwork reaches the desired length. Keep your thread tension average—not too tight and not too loose. Tight thread tension can cause the rows to buckle and prevents the rows from separating. Too loose tension may show thread between the beads. Use the Sand and Sea pattern to make a pretty netted bracelet shown in this project. If you prefer a beading diagram, in the topmost diagram above, a total of twenty beads have been strung. The second diagram shows the thread passing back through the eighth from last bead, which is a link bead. In the third diagram, three beads are picked up, three beads in the first row are skipped over, and the thread passes back through another link bead. The bottom diagram shows the first and second rows completed and the thread positioned near the end of the second row. This row actually ends when you pick up another set of beads to make the turn that begins the third row. You now pick up an odd number of beads to make the turn and begin the third row. These beads are referred to as "turning beads" The precise number of turning beads you pick up varies by pattern. In the topmost diagram above, there are five turning beads. After making the turn, continue the netting stitch back toward the opposite edge of the beadwork. Notice that the middle bead in each set of beads you stitched in the second row now becomes a link bead. At the end of the third row, pick up another set of turning beads. The second diagram above shows five more turning beads picked up to make the next turn.